Home Google ViBe Android App 2.0 Now Featuring Unlimited Custom ViBes, Custom Search, Settings Widget & More! After listening to it’s users – I wish more apps would do this – ViBe, the (free) Android app that lets you set vibration patterns for your various phone contacts, released some major updates to it’s app into the Android Marketplace today. Version 2.0 of ViBe, that went live today now allows it’s users to create their own ViBes to assign to their various contacts. You can now choose from a custom ViBe bundle that unlocks the whole app for just $4 or get individual premium ViBes at 99 cents a piece. If you want to ‘unlock’ the custom vibe creation feature, you would get the bundle which also unlocks all the remaining premium ViBes. Paul Benjamin, the Co-Founder and CFO of ViBe App’s parent Company Base2Apps tells us that this was one of the most requested features by ViBe users. It always delights me to see App developers acting on feedback from their users, because at the end of the day, the customer is still always right. Here is the full list of updates and new features included in this release. Get the FREE ViBe Android App on the Android Marketplace here. Unlimited Custom ViBes: You can now create and save an unlimited amount of your own custom ViBe patterns once you ‘unlock’ this feature (see above for details). 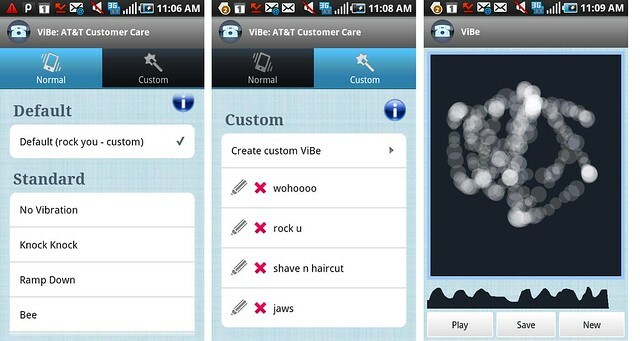 3 Responses to "ViBe Android App 2.0 Now Featuring Unlimited Custom ViBes, Custom Search, Settings Widget & More!" ViBe is a very useful app! Thank you for the post! ViBe just got cheaper! The price was reduced for the full version to $1.99.